Leave it empty. 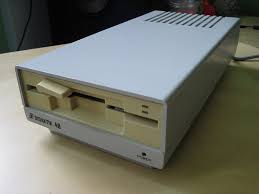 In floppy drives, the read/write head touches the disk’s surface, so leaving a disk inserted for long periods of time can cause problems — the head will tend to stick to the surface, pulling it off when the drive is next powered up. Some drives shipped with a cardboard insert which was intended for use in shipping and long-term storage, but that was more common with 5.25” and older drives. Some drives also have shipping screws to lock everything in place, but I wouldn’t expect that on a 3.5” drive. Do not store your FDD closed not even with the dummy carton/plastic disc!!! For 5.25" floppy insert the carton dummy disc but leave the FDD open. For 3.5" do not even insert disc !!! Both problems are affecting the Head load force and position causing read/write errors making the drive inoperable (only due to mechanical reasons). So It is better to leave the heads in the open/non-inserted position and the best option is to use the fixating screws in open position if present (which is improbable). Not the answer you're looking for? Browse other questions tagged floppy-disk disk-drive or ask your own question. What is the danger involved in trying to write already closed file with Commodore 1541 disk drive?